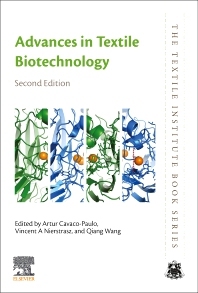 Advances in Textile Biotechnology, Second Edition examines the latest in biotechnology for the fiber and textile industry. This new edition has been fully revised to include the current essential areas of development in the field, covering both natural and synthetic fibers. Chapters cover the latest technology in bioprocessing for bast fiber, PVA, polyester, wool and silk before exploring issues of enzyme stability. Essential areas of application and development are then considered, including biomedical textiles, silk materials for biotechnological applications, bacterial cellulose, the ink jetting of enzymes, and the role of enzymes, wool and silk fibers. Containing groundbreaking research, this book will be essential reading for manufacturers, designers and engineers in the textiles industry, textile and fiber scientists, and academic researchers and postgraduate students working in the area of textile technology. Artur Cavaco-Paulo has been Professor at the Department of Biological Engineering, University of Minho, Portugal, since 1990. Dr. Cavaco-Paulo has a large number of published articles and books to his name, including as co-editor for ‘Textile Processing with Enzymes’ (Woodhead, 2003) and for the first edition of this book (Woodhead, 2010). His current research interests focus on biobased processes for fibre and polymers, biocatalysis, protein and emulsions stabilities, and drug delivery using enzymatic systems. Vincent A. Nierstrasz is Professor in Textile Materials Technology, Department of Textile Technology, Faculty of Textiles, Engineering and Business / The Swedish School of Textiles, University of Borås, Sweden. His research focuses on resource effective textile processes for functional and smart textiles. Qiang Wang is Professor at the Department of Textile Chemistry, College of Textiles and Clothing, Jiangnan University, China. His research focuses on textile biotechnology and eco-friendly textile processes.